"Bridesmaids" printed with gold script. All time classy and elegant, absolute stylistic gift choice to bride. Perfect wedding day bag with interior pocket to carry all of the essentials, including the interior pocket for small accessories . 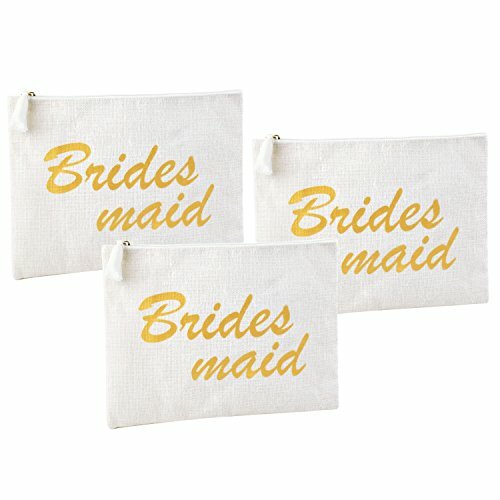 "Bridesmaids" is professionally printed with high quality gold script , and this clutch handbag can hold most of your necessary belongings such as cell phone, keys, cosmetic and other feminine items, etc. Great gifts handbag for bridesmaid,ladies,womens, girls, friends ,sisters, brides on the bachelorette party, bridal shower party, wedding party, wedding engagement, honeymoon and other milestone moments. Friendly reusable jute clutch bag for wedding, party, daily use and evening out.